This is for a tropical tango pink flamingo garden statue, metal sculpture from Shopatusm. Looking to add fun and frolic to your surroundings? Then it's time to think pink! 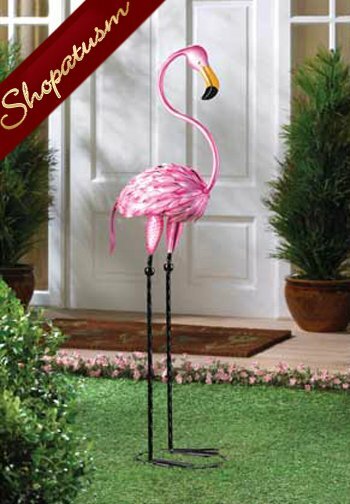 Irresistibly charming metal flamingo sculpture brightens any room with a taste of the tropics - and at nearly 3 feet tall, it's a style statement with serious smile power. Weight 2.6 lbs. 8 3/4 inch x 10 1/2 inch x 35 5/8 inch high. Sheet metal. Some Assembly Required.